Are you having trouble finding an efficient way to organize and store your collection of rolled up posters? Well StoreMoreStore has poster cubby shelving to help you get control of all those rolled up prints and posters. Whether you’re storing movie posters, sports memorabilia posters, educational information signage posters, music posters, historical posters, medical posters, or any other kind of posters, our flexible and adjustable steel poster storage shelving will help you organize your posters for quick access and maximize your storage space. 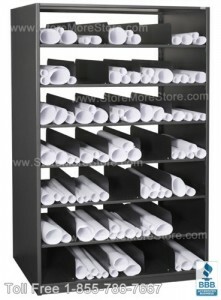 A perfect way to organize and protect your rolled posters and prints is to store them in poster cubbies. Poster cubby racks have multiple adjustable partitioned storage openings where posters and prints can be categorized and stored safely, so they won’t get crushed or damaged. StoreMoreStore has poster cubby racks in a variety of sizes and options for your rolled poster needs. If you don’t see the exact poster storage rack you are looking for, call us toll free at 1-855-786-7667 and we will help you design a poster storage rack exactly the way you want. Besides organizing your posters, rolled poster storage shelving will maximize the number of posters you can store in a designated area because posters are stored on vertical shelving. Vertical poster shelving and racks are easily adjustable and can be configured to store a variety of items (posters stored flat and other poster related storage materials) all in the same storage unit. People who are interested in rolled up poster shelving might also be interest in flat file drawer cabinets and hanging poster compartments also available from StoreMoreStore. Flat drawer cabinets store historical posters and master print documents safe and flat, so you can rest assured they won’t be torn or maimed. Hanging poster compartments keep posters in a flat unrolled storage environment but store the posters vertically in acid free compartments. Storing posters vertically in hanging compartments will save space compared to storing posters horizontally flat on shelves. Shelving for the hanging poster compartments are not on our online store yet so give us a call at 1-855-786-7667 or send us an email and we will be glad to get you a quote on the shelving. Visit StoreMoreStore.com or call us today at 1-855-786-7667 for more information on protecting and storing your posters in poster shelving and racks.